﻿ Alpha Glucosyl Rutin | Products | Toyo Sugar Refining Co.,ltd. Rutin is found in fruits (apricot, berries, cherries, citrus), vegetables, azuki beans and herbs such as green tea and black tea. Its richest source is buckwheat, a plant consumed in Japan since ancient times for its health promoting benefits. Despite its antioxidant properties and ability to stabilize pigments, rutin has been of limited use, due to poor solubility. We were able to significantly increase the water solubility of rutin by developing αG Rutin (Alpha Glucosyl Rutin), using our proprietary enzyme technology. With water solubility 12,000 times higher than that of rutin, alpha glucosyl rutin finds application in beverages, foods, functional foods and cosmetics. Alpha Glucosyl Rutin (trade name: αG Rutin) is a highly water soluble, stable and odor-free bioflavonoid that can be used in a variety of foods, beverages and personal care products. The increased bioavailability that results from the increased solubility is of significant importance. Natural pigments are usually unstable when exposed to sunlight. Ultraviolet-A (UV-A) as well as ultraviolet-B (UV-B) exposure results in the bleaching of these pigments, dramatically reducing the value of their application in foods, beverages and cosmetic products. Using Alpha Glucosyl Rutin can significantly maximize the protective effect from the damage of ultraviolet light. The enhanced photostability makes it possible to formulate products that resist color fading over time. 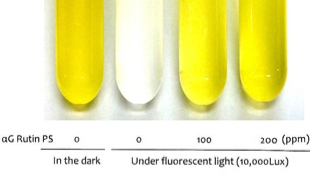 0.05% β-carotene solutions were stored in the dark or under fluorescent light (10,000 Lux) for 72h at 15°C with or without αG Rutin. Alpha Glucosyl Rutin (αG Rutin) is a highly safe and stable bioflavonoid. Its antioxidant and stabilizer properties are used in foods and beverages to prevent the photodegradation of natural pigments (carotinoids, anthocyanins and the likes). In supplements, Alpha Glucosyl Rutin may be used to fight tissue glycation, one of the factors causing aging and accountable for many aging-related illnesses. αG Rutin can be taken in the form of tablets, granules, powders and liquids. Rutin is found in fruits (apricot, berries, cherries, citrus), vegetables, azuki beans and herbs such as green tea and black tea. Its richest source is buckwheat, a plant consumed in Japan since ancient times for its health promoting benefits. Despite its antioxidant properties and ability to stabilize pigments, rutin has been of limited use, due to poor solubility. We were able to significantly increase the water solubility of rutin by developing αG Rutin PS-S, using our proprietary enzyme technology. With water solubility 12,000 times higher than rutin, glucosyl rutin finds application in a variety of cosmetic products as a rejuvenating and anti-aging ingredient. Keratinocytes, the constituent cells of the epidermis and first layer of skin defense, are continually exposed to DNA-damaging UV-B. The result of this exposure is skin photoaging, which is characterized by rough texture, dramatic loss of elasticity and irregular pigmentation. The strong anti-oxidant and UV absorption properties of Alpha Glucosyl Rutin make it an ideal ingredient for the prevention of premature aging of the skin and its negative effects. Glycation is a process in which reducing sugars react with free amino groups of proteins to form irreversible products known as Advanced Glycation End-Products (AGEs). The resulting protein-to-protein cross-linking causes intracellular damage. The skin gradually losses its elastic property and becomes vulnerable to sagging and wrinkling. As a strong anti-oxidant with exceptional radical scavenging activity, Alpha Glucosyl Rutin inhibits the formation of AGEs, making it an ingredient of choice for anti-aging cosmetic products as well as for supplements. Photoaging of the skin is generally associated with dark spots, fine lines, wrinkles and the loss of elasticity. These negatively affect the natural youthful appearance of the skin and are primarily caused by the loss of elastin and collagen. As a strong anti-oxidant combined with UV-absorption characteristics, Alpha Glucosyl Rutin can help protect the epidermis and dermis against UV-induced damage. *This infomation is not intended to be used for medical purposes. Copyright © 2011 Toyo Sugar Refining Co., Ltd. All Rights Reserved.